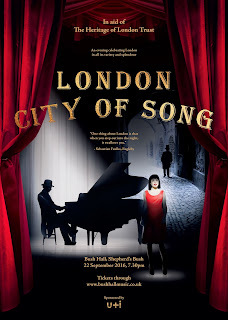 Tomorrow night (22 September 2016) the concert London: City of Song at Bush Hall, celebrates every aspect of London's vibrant street-scape in words and music. Soprano Joanna Songi and baritone Jerome Knox are joined by pianist Nigel Foster and actress Sarah Berger for a programme which ranges from folksong, Laura Marling and Ralph McTell to Noel Coward, Gershwin and William Walton with spoken word extracts from Zadie Smith, Neil Gaiman, Richard Rider, Virginia Woolf and many more. We are promised London's darkest corners, its lavender-sellers and Thames boatmen, 19th century émigrés and the Bloomsbury set and many more. The concert is being given in aid of the Heritage of London Trust, an organisation which seeks out restoration projects which help beautify the city of London, keep its character and charm, and provide a link to its diverse history.